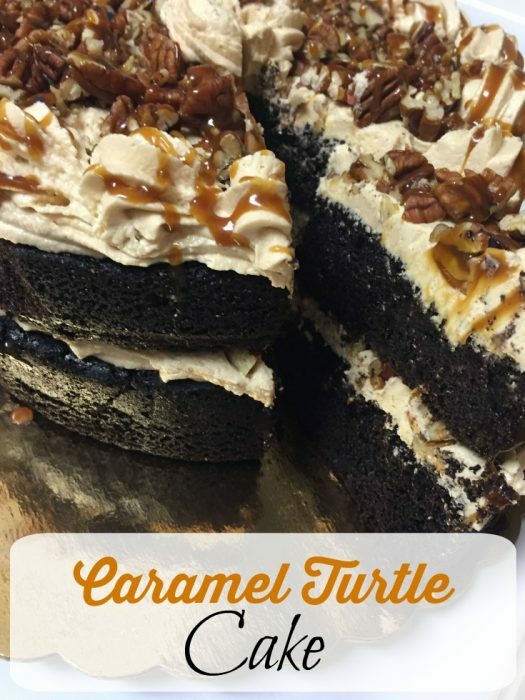 If you love the combination of chocolate and caramel then you are going to LOVE this Caramel Turtle Cake. 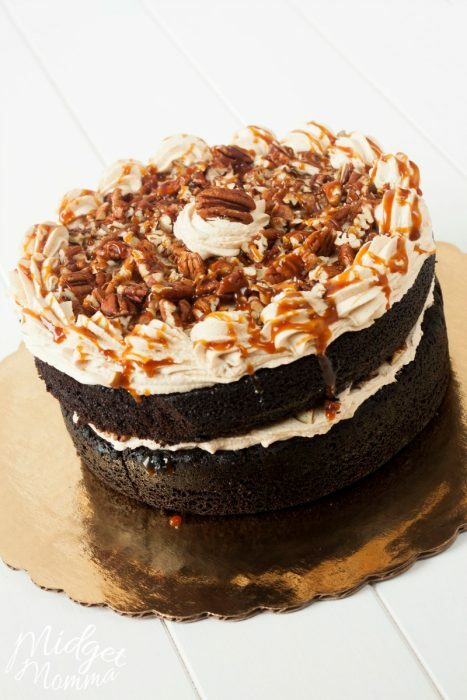 Made with the best chocolate cake recipe, homemade caramel frosting, homemade caramel sauce and topped with crunchy pecans! It is such an amazing cake! Plus with this Chocolate caramel turtle cake, if you struggle with frosting a cake you don’t need to worry about that as this is an easy chocolate layer cake. I decided to turn the candy caramel turtles into a cake! For anyone who hasn’t had one, it is pecans covered in caramel topped with rich chocolate. It is one of my favorite combinations. After creating this cake recipe I also made amazing Chocolate Caramel Turtle cupcakes that were a big hit as well! 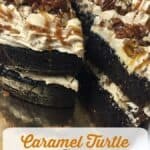 To make this chocolate layer turtle cake you are going to use 1 batch of homemade caramel sauce and 1 batch of caramel icing. If you do not want to make the caramel yourself you can always go to the sundae section and get a jar of caramel sauce. It will not be the same but it is very close, although I would be lying if I said I didn’t like the homemade one a lot more. If you do not want to take a try at making a caramel sauce, my next favorite one to use is this Ghirardelli Caramel sauce. Grease two 8inch pans and line them with parchment paper. In a medium mixing bowl mix together the eggs, buttermilk, oil, and vanilla. In a large mixing bowl whisk together the flour, sugar, cocoa, baking soda and salt. Pour the wet ingredients into the dry ingredients and mix just until they are incorporated. Pour in the boiling water and stir until well combined. Pour the batter into the two cake pans evenly. Reduce the oven to 300 degrees and bake the cakes for 30-35 minute or until a toothpick comes out clean from the center. Let the cakes cool for 5 minutes then transferring the cakes to a cooling rack. Let them cool for an hour. Slice the tops of the cakes just so they are nice and flat. Place one cake onto your serving platter. Place the buttercream into a pastry bag that has a star tip inside. Pipe out a half inch layer of buttercream onto the first layer of cake. 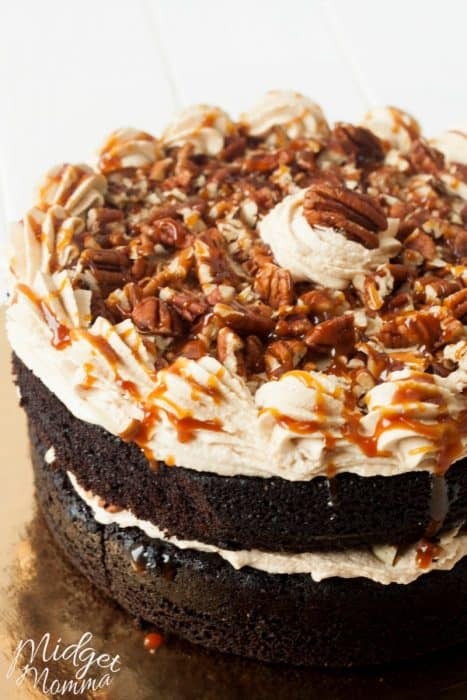 Sprinkle half of the pecans over the buttercream then drizzle with about 2 tablespoons of caramel sauce. Place the second cake on top. Pipe another half inch layer of buttercream and sprinkle the remainder of pecans on top making sure to leave a half-inch border around the cake. Drizzle the caramel sauce over the top of the pecans. Pipe a border of buttercream around the top of the cake and one swirl right in the middle. 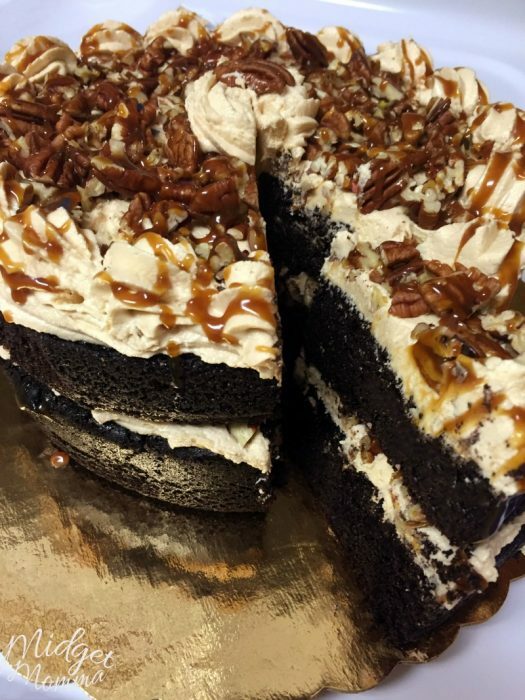 You can add a whole pecan right in the middle of the cake to finish. Looking for more tasty goodies? Check these out! How are we suppose to remember these receipes? If they have no print command for them what do we have to do? Memorize them? I have now added a print off so you will be able to print it.